March 2015 is a very jam packed month in terms of CCM and pop album releases. Artists such as Third Day, Casting Crowns, Worship Mob, Kevin Max, Hawk Nelson, Newsong, Britt Nicole, NF and Passion are all releasing highly anticipated albums, bringing this month to be probably one of my most enjoyable months in terms of music for a while. But before we arrive to all of those albums (and we will review each of them! 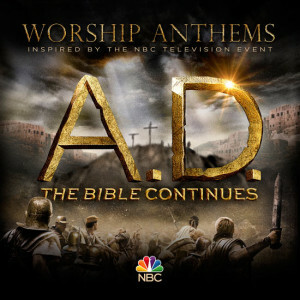 ), let’s take a look at another high profile album- Worship Anthems Inspired By The NBC Television Event AD: The Bible Continues. If you have been avidly following Mark Burnett and Roma Downey’s projects for the past while, then you know that the TV miniseries The Bible, which aired on The History Channel in 2013, was one of the year’s most watched TV miniseries in that year, and despite the polarising content and overt Christian messages and themes, quite a lot of people loved the series, even though some viewers may not have been Christians when they saw the miniseries. It’s a bold move that is truly an evangelism tool, and because of the success of the show, NBC has picked up Mark and Roma’s ‘sequel’ to the miniseries, titled A.D., with the show depicting life for the early Christians after Christ’s resurrection and ascension into heaven. One of the series which I am avidly waiting for (and which I will review for this site); Integrity Music has compiled a soundtrack album to the TV series. With 14 well known worship songs sung by up and coming artists as well as seasoned veterans, let’s dive in, and see if we can be blessed and inspired as we approach the premiere date of the series on Easter Sunday! Opening proceedings is the smash hit song “We Believe” written by Richie Fike, Travis Ryan and Matt Hooper, and made popular by the Newsboys, and is fitting as the first song, considering that it overtly speaks about the gospel through the Nicene Creed. Opening with a powerful and epic guitar riff and a chilling piano undertone, this emphatic and no-nonsense track professes what we as Christians believe about Jesus Christ. As believers, we can say without question that we believe in the Trinity, the crucifixion, the resurrection, and the second coming of Jesus Christ on Judgement Day in the future. While Rich Mullins gave us the biblically sound “Creed” (which was made famous by Third Day), which in essence says the same thing; it’s definitely nice to hear another explicit proclamation of our faith that ‘…the gates of hell will not prevail, for the power of God, has torn the veil, now we know Your love will never fail; we believe…’. A quick glance through the rest of track list reveals plenty of familiar tunes and artists. Jeremy Camp covers Desperation Band’s well known worship anthem “Overcome” quite superbly, with passion and purpose as we hear Jeremy belt out the words of ‘…all authority, every victory is Yours…’. Though the song seemed a tad long at 8 minutes, it was still enjoyable as a melody to sing on Sunday mornings. Natalie Grant (“Your Great Name”) and Kari Jobe (“Healer”) also provide reflective, inspirational worship ballads, with each of them shining in their vocals, with these songs being some of the best of their career. They’re easy for us to sing and mediate in the Lord’s presence, either personally or corporately, and that’s what makes me marvel at the simplicity of the words yet also at the poignancy and potency of the meaning behind the words. Rend Collective brings the tempo back up with the jovial, energetic guitar led folk tune “Build Your Kingdom Here”, where Chris Llewelyn and the band joyfully express their thankfulness to Jesus, asking Him to build His kingdom here on earth as it is in heaven, and providing us with hope that ‘…we are the church, You are alive in us…’. Darlene Zschech’s majestic epic live anthem “Victor’s Crown”, the album closer, is another explosive upbeat melody and album highlight, with mysterious synth opening the track as the song plays out like an orchestral movement. Co-written with Kari Jobe; this gem of a song proclaiming ‘…Hallelujah, Jesus You have overcome the world…’ has me surrendering to God also, as I wholeheartedly agree with everything Darlene has laid out; that our existence is meant to be for worshipping Jesus and that He reigns high above on the Victor’s crown. Kim Walker Smith’s rendition of “Spirit Break Out”, is yet another strong offering featured here, and is the pinnacle of worship leading. Seriously, if you had to listen to one song to know how to worship God, this would be it. Holding nothing back, and going for it 110%, Kim’s style of worship has won me over, and trough the use of orchestral instruments in the bridge, this epic anthemic track builds and builds to an awesome crescendo, and brings a smile to my face! “Make A Way”, co-written with Jason Ingram again, is another gem of a track, where Jon from Desperation Band earnestly reminds us that ‘…where this is no way, You make a way, where no one else can reach us, You find us…’. It’s a sobering and also comforting thought that Jesus will search for us and will find us every single time we try to run away from Him or find ourselves falling away; and I believe this necessary song is sure to strike a chord with many listeners who feel like they’re in the position of Jonah or the lost sheep in the Bible. A slow piano led ballad that builds to an epic and majestic like Holy Spirit led worship anthem; this is Jon at his peak vocally and songwriting-wise; it’s one of the best songs Desperation Band have written and recorded! The acoustic guitar driven slower paced melody “Buried In The Grave” from All Sons And Daughters is where the duo eloquently sing about Jesus rising from the dead, and us trying to comprehend such love for us with gratitude, while Lincoln Brewster’s “There Is Power”, from the Oxygen album, is a ballad, exhibiting poignancy and enthusiasm as Lincoln reminds us that ‘…there is power in the name of Jesus, there is power, power in His name…’ A song that most likely will be a radio single later on during the year, Lincoln presents us a song to both sing in churches and sing individually, an anthem that is very congregational-worship friendly. And rounding out the familiar tracks is the immediately recognisable “Your Name”, sung by Paul Baloche. The track doesn’t really need any explanation or further analysis, simply put though- it’s played on the piano and it’s Holy Spirit anointed, as Paul eloquently reminds us that ‘…Your name, let the nations sing it louder, cause nothing has the power to save, but Your name…’. In my opinion, “Breathe” by The Brilliance, one of the 3 entirely new tracks, which was released earlier this year, was completely forgettable, though objectively the track is artistically brilliant, but didn’t connect with me on a deeper level for some reason, as the band sing out their cries for God to breathe on them. But the other 2 completely new tracks make up for this ‘blunder’ as I am once again wowed by the songs “Great I Am” and “Oceans”. “Great I Am” delivers the theme of proclaiming that Jesus is Lord and across the acoustic guitars which starts off the melody of optimism and positivity; one of my favourite lyrics in this anthem is when both Danny Gokey sings out in the compelling second verse that ‘…I wanna be near, near to Your heart, loving the world, hating the dark, I wanna see dry bones living again, singing as one…’. Stepping right into the deep end lyrically, and delivering authoritative words in the bridge that is not sugar-coated at all; “Great I Am” breathes an epic and majestic feel as Paul Wilbur, Sharon Wilbur and Danny Gokey each bring the song to life in another different light. It is great to sit and reflect on all the good things God has done for us; and as Christ reigns over all, we can truly cry out ‘…hallelujah, holy, holy, God almighty, the great I AM…’, to the God who is in control of every aspect of our lives! And “Oceans”…well, it’s “Oceans”, what more do I have to say. Sung by up and coming worship movement WILDFIRE7; the epic anthemic prayer, and declaration of Jesus’ sovereignty, delves into the fact that we can call upon God’s name, and rest in the hope and security that we are God’s and He is ours. Taking off in a way unlike no other Hillsong song in recent years. We are met with a song that confronts and reassures at the same time, and asks us the question of whether we’d follow God in the direction that He calls us to when he calls us to it. Every time I hear this song I am almost drawn to tears, as I commune with God, and this version, though covered by an ‘unknown’ group, continues on this positive trend! Handpicking songs directly relating to Jesus’ resurrection and what it means for us today, the soundtrack to A.D. contains some pretty impressive artists singing well known and original songs. From Newsboys and Natalie Grant to Desperation Band and Rend Collective; Worship Anthems Inspired By The NBC Television Event AD: The Bible Continues is a must for any fan of worship music, any fan of The Bible miniseries, or any fan of the channel NBC. Or all three. So what are you waiting for? You will find a worship song on the album to inspire you and possibly change your life; so dive in, and let me know your thoughts! Well done everyone involved as you minister to others in your sphere of influence! Previous PostAlbums Releasing This Week (22nd-28th February 2015)Next PostTop 10 ___: Top Ten Christian Bands With A New Lead Singer And…A New Genre?